The Ndutu Region forms part of the northern section of Ngorongoro Conservation Area and stretches to the unfenced southern reaches of the Serengeti National Park, a meeting point between these two incredible wilderness areas. 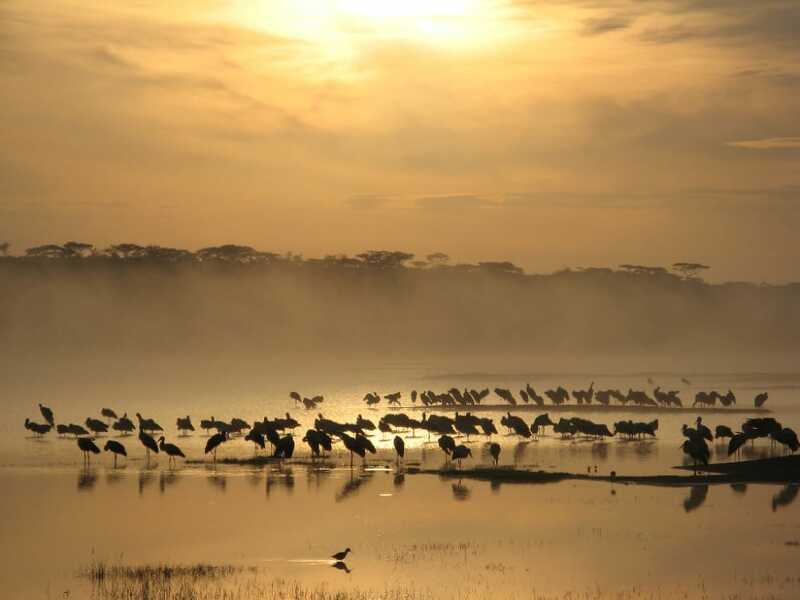 This section of the park is made up of rolling grasslands peppered with alkaline lakes that attract flocks of flamingos, as well as acacia woodlands. There’s year-round resident wildlife (such as giraffe, elephant, hyena and various antelope species) in the Ndutu Region, and you can spot animals around the waterholes during the dry season from June to November. Look out for the six cat species – lion, cheetah, leopard, serval, African wild cat and caracal – that are present throughout the year. The best months to visit the Ndutu Region are from December, when the Great Migration herds start to arrive from the north, until April when the millions of wildebeest, zebra and gazelle have trekked northwards again. 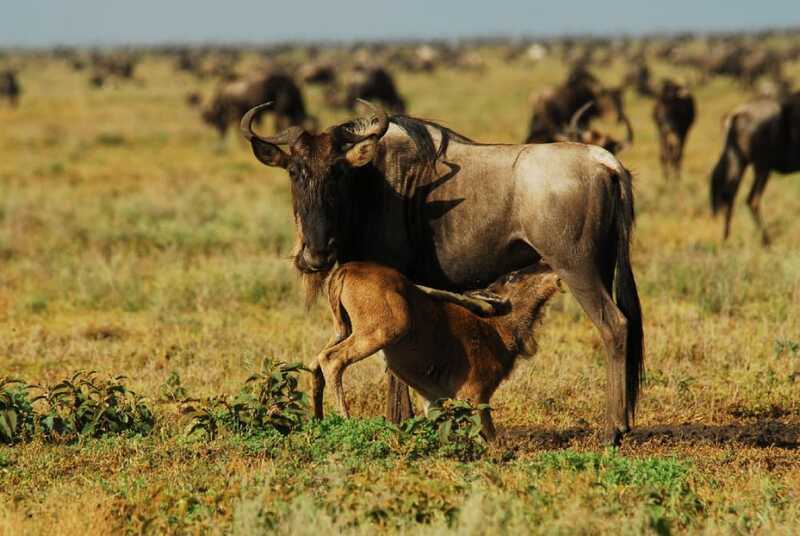 In the early months of the year – with a peak in February – the wildebeest herds are calving on the verdant grassy plains: thousands upon thousands of baby animals are born every day, attracting the attention of cheetah, lion and hyena. A big draw of the Ndutu Region is to see the full circle of the Great Migration, from the return of the herds to graze in December, and then the calving which takes place in January and February, and then the departure of the herds again in April as they start making their journey northwards. Calving season is particularly dramatic: a million wildebeest give birth to 8000 babies every day, and as these newborns take their first steps, they’re targeted by lion, leopard, cheetah and hyena. 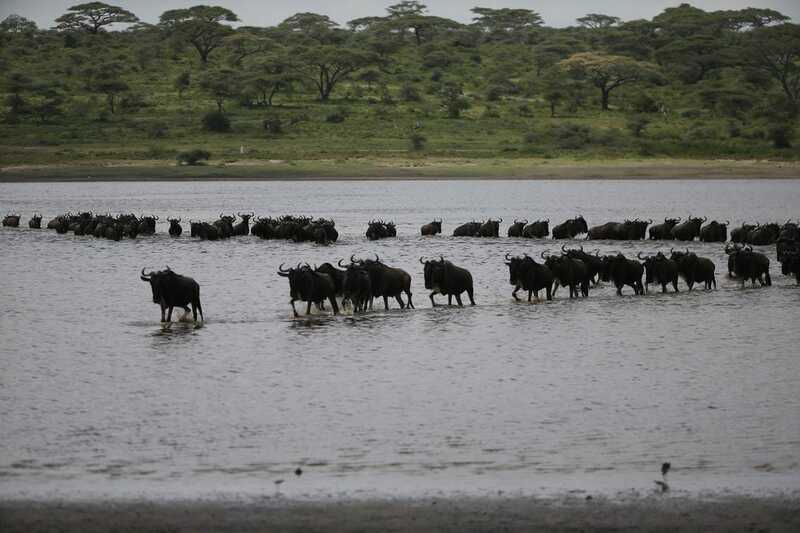 The prime game viewing spot in the Ndutu Region is around Lake Ndutu, where enormous herds congregate between December and April to graze and calve. The forests and granite kopjes around Lake Ndutu are also home to lots of game outside of the migration months. Sightings of six species of cats – leopard, lion, cheetah, caracal, African wildcat and serval – are a big highlight of visiting the Ndutu Region. You can spot the cats throughout the year, but the best viewing is during the calving months of January and February, when these predators pick on the fledgling baby animals. A trip to Ndutu is not just about wildlife and landscapes – there’s incredible cultural heritage to explore too. Lying within the Ndutu Region, Olduvai Gorge (also known as Oldupai – the correct Maasai spelling of the word) is one of the world’s most significant paleoanthropological sites, thanks to the discovery of the earliest evidence of the existence of our human ancestors. Visit the dramatic ravine and spend some time in the museum to learn about the fascinating excavations and discoveries that have taken place here. A visit to Olduvai Gorge should be combined with a stop at the nearby Shifting Sands: mysterious and beautiful dunes formed of volcanic ash that move with the winds. For adventurous travellers, you can do multi-day walking safaris starting in the Ndutu Region and heading into the highlands of the Ngorongoro Conservation Area, and for the very intrepid, you can combine the walking safari with an ascent up the active volcano of Ol Doinyo Lengai. Day trips to the Ngorongoro Crater are a highlight of staying in the Ndutu Region. The remains of a massive volcano, the Ngorongoro is one of the most superb wilderness areas on the continent, and boasts some of the greatest populations of animals – particularly predators – found in Africa. With no public campsites, Ndutu isn’t the best region for budget travellers. Your best budget-friendly option would be to stay at one of the mid-range mobile tented camps that operate in the area. As with most areas of the Serengeti, camps and lodges are mainly in the upmarket range. Due to the seasonal nature of wildlife, lodges tend to only open for the peak season from November to March. Camps and lodges in the Ndutu Region can either be located in the Ngorongoro Conservation Area or in the Serengeti National Park, so keep in mind that you’ll need to pay park fees for each park if you’re staying in one park and doing game drives in the other. You can reach the Ndutu region by road from Arusha, which is around six hours’ drive away through the Ngorongoro Conservation Area. A quicker way to reach your lodge if you’re not self-driving is by air: the Ndutu Region is served by several airstrips, and it’s a quick flight from Arusha.